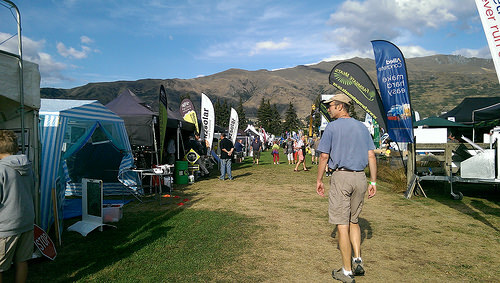 We’ve arrived early at the Wanaka Agriculture & Pastoral Show and already there’s quite a big queue at the ticket office. 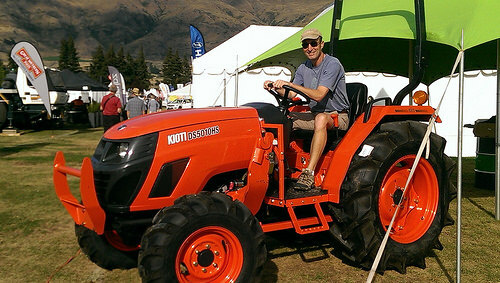 The Wanaka Agriculture & Pastoral Show is held in March each year along the shores of Lake Wanaka. Boys get to be boys. And some even get to meet their Super Heroes. Merino Wool is celebrated in a big way at this show. Pure Merino wool is considered by many to be the best in the world for warmth and versatility. 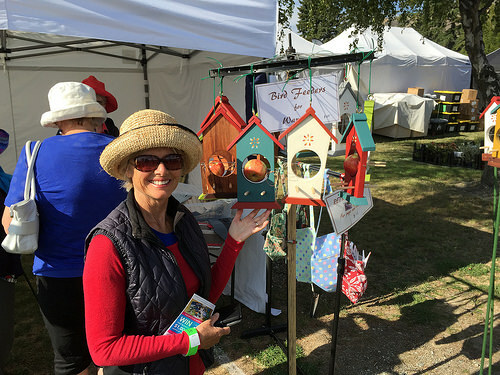 This is the ideal time to buy those cute little gifts that you’ll won’t see anywhere else. Yes, this is a real apple in this birdfeeder! What I love, is the original sturdy outdoor furniture, built to last a lifetime. 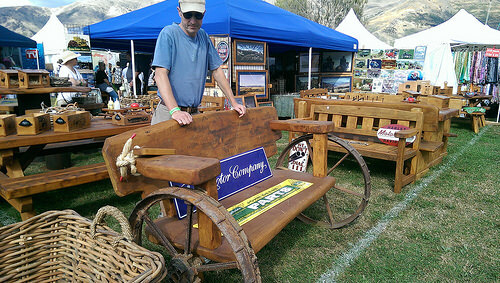 I’d love this outdoor seat with the wheels. Maybe Michael could make one – probably wouldn’t look quite like this one though. Just saying. 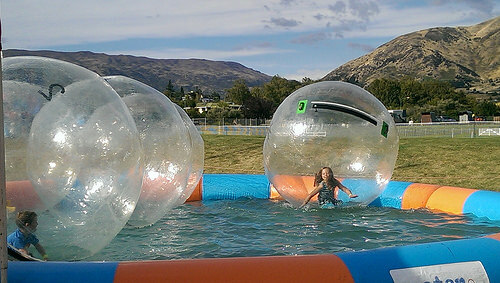 Travellers with children will love the Wanaka Agriculture & Pastoral Shows. Its a great chance for the kids to ‘let off steam’ for a while. There’s so much to catch their interest. The whinnying sound of show jumping horses add to the atmosphere.They look magnificent today with their plaited manes tossing impatiently in the air. Today, these four-legged kings reign supreme. It’s amusing to watch their immaculately dressed riders fussing around collecting their poo. I love the dog trials! The intelligence of these ‘eye’ dogs are amazing. 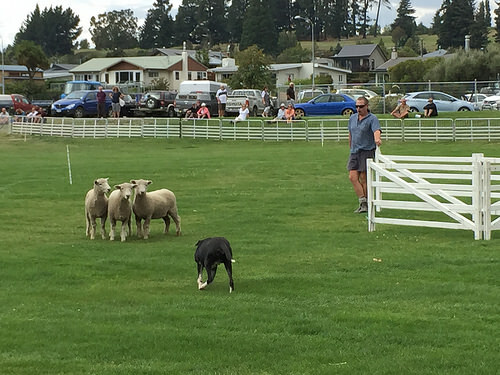 The best performance are by dogs with very calm handlers. These dogs refuse to be distracted. The sheep get off likely. All they have to do is is trot around looking slightly confused then follow the lead into an open pen. 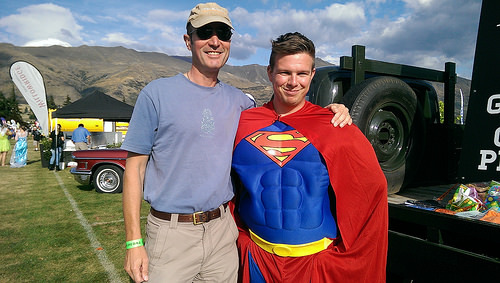 As a traveller, you can learn a lot by just walking around listening to the local idiom, learning how Kiwis express themselves and sometimes hearing the accent for the very first time and getting an insight as to what makes us tick. Maybe the kids should get the last word here. Cos these little guys only need to look around them to know what makes them happy. 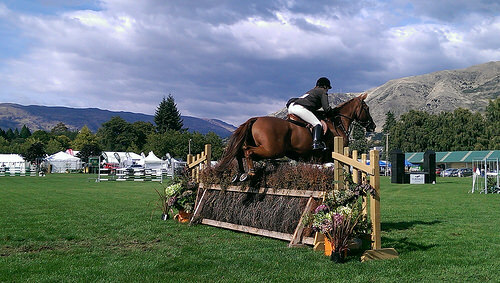 Fantastic – love A&P shows. We went to two this summer and it was a great trip down memory lane from when I was younger but very bit as enjoyable as an adult. Hey Jan, it’s always such a happy time for everyone. Even the old tacky clown faces that move from side to side, have been given a spruce-up. They look great now. We’re going back again for the last day. Going to the A+P is one of my most favourite things about living here. 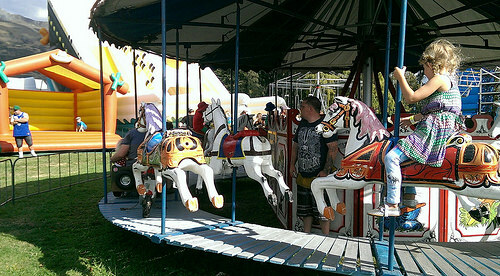 English country fairs are lovely but the A+P is the apogee – great fun, lovely local foods to try, a ride on a tractor and loads of animals to look at. Top Day Out!